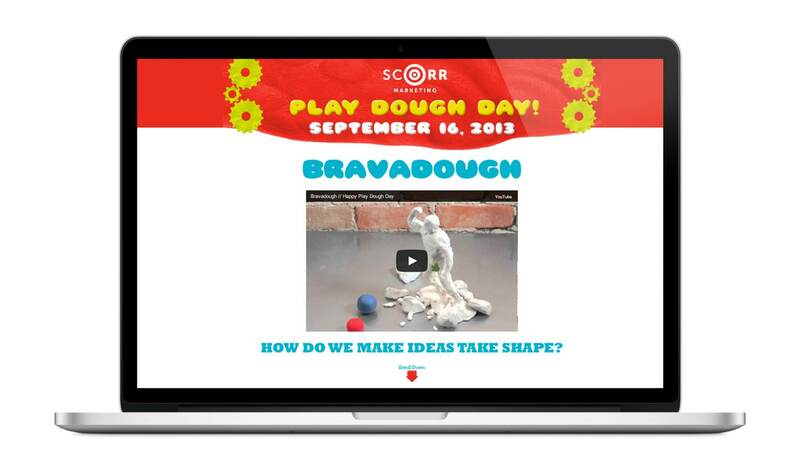 At SCORR, we think it’s important not to take ourselves too seriously. 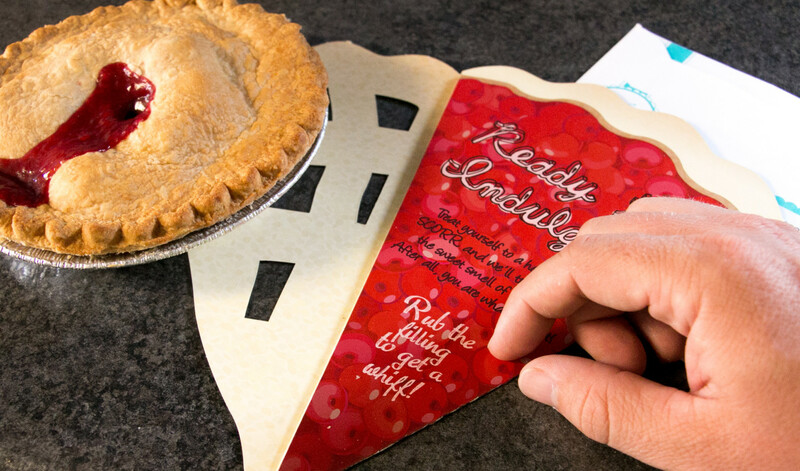 One of the ways we do this is by celebrating the less appreciated holidays. 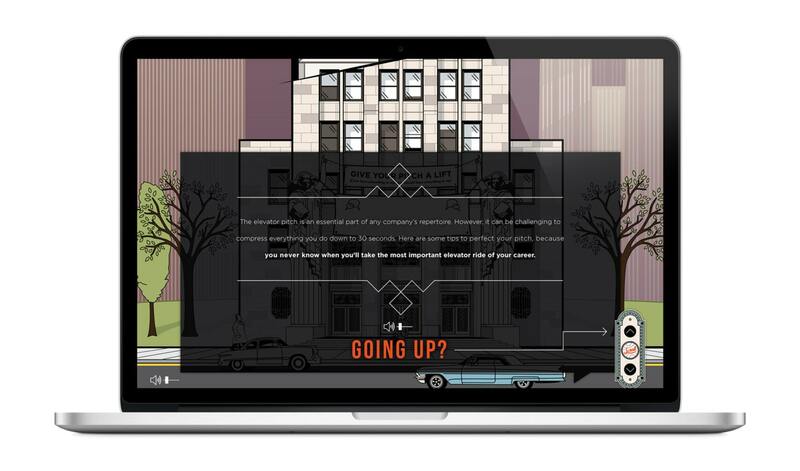 Whether we’re building a microsite, creating a children’s book or writing, directing and starring in a series of short films set in an elevator, we like to have fun and push our creative boundaries. 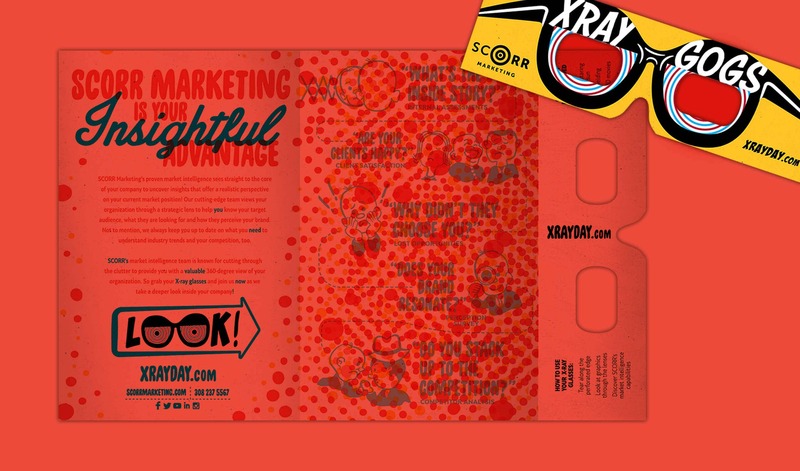 To provide further insight into the services our market intelligence team provides to drive and direct marketing programs, SCORR created a card for X-ray Day with detachable X-ray glasses that were required to view a message hidden within the card design. 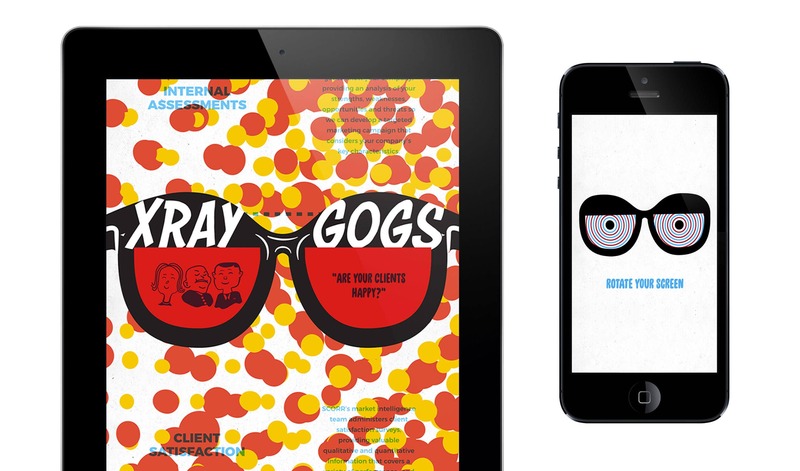 Using the glasses, readers got a deeper look into our client satisfaction surveys, lost opportunity surveys, perception surveys and competitor analysis. 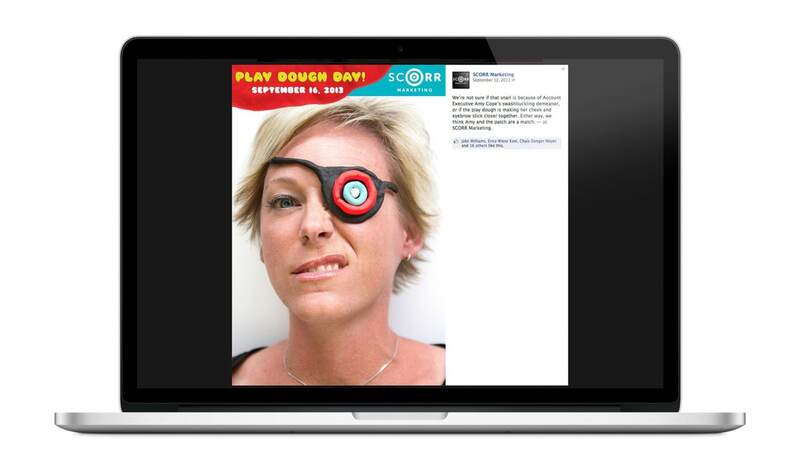 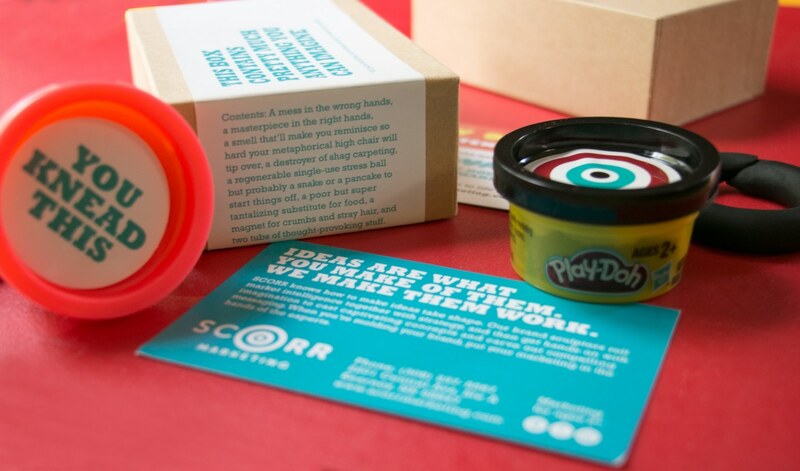 In addition to the card, SCORR created a microsite, which features a digital version of the goggles. 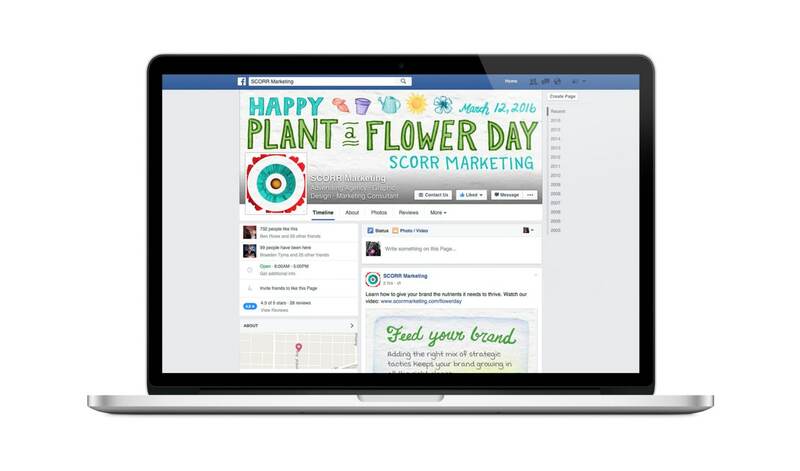 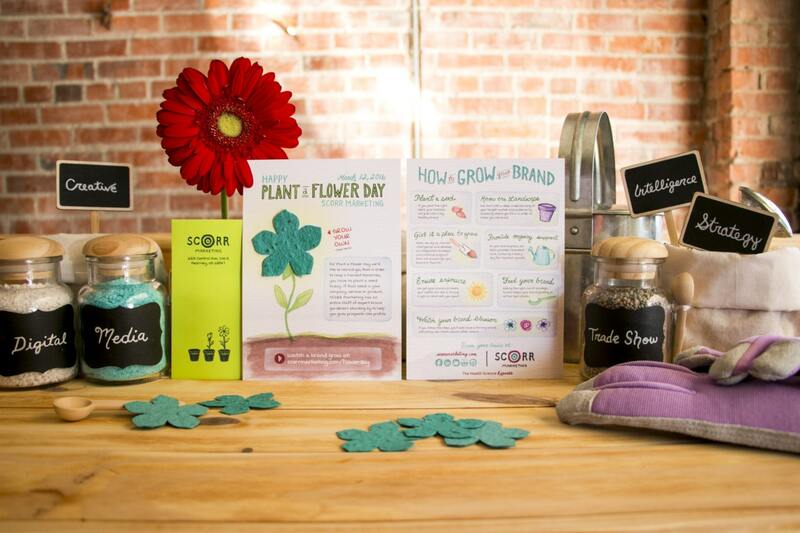 To celebrate Plant a Flower Day, SCORR sent out a card reminding recipients that, in order to reap a harvest, it is necessary to plant a seed. 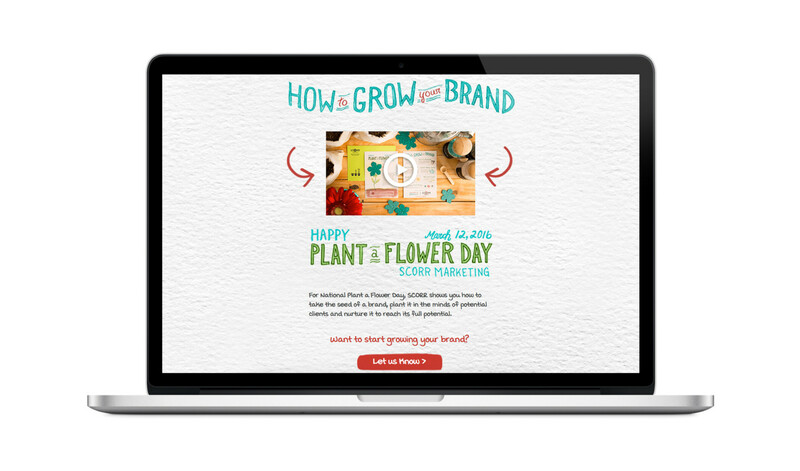 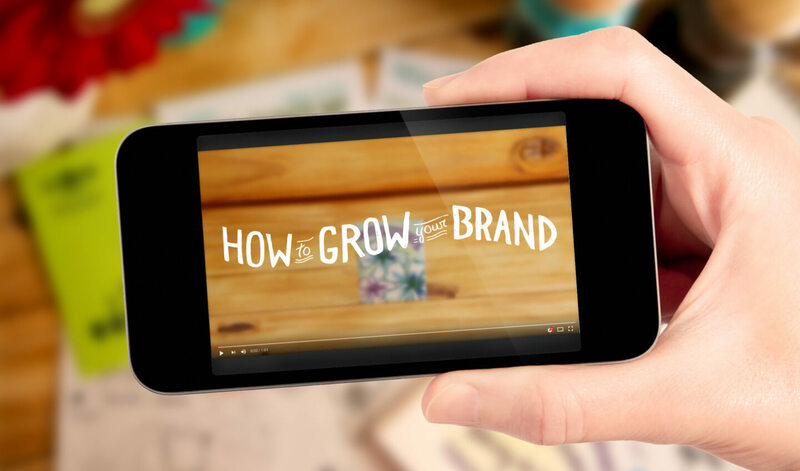 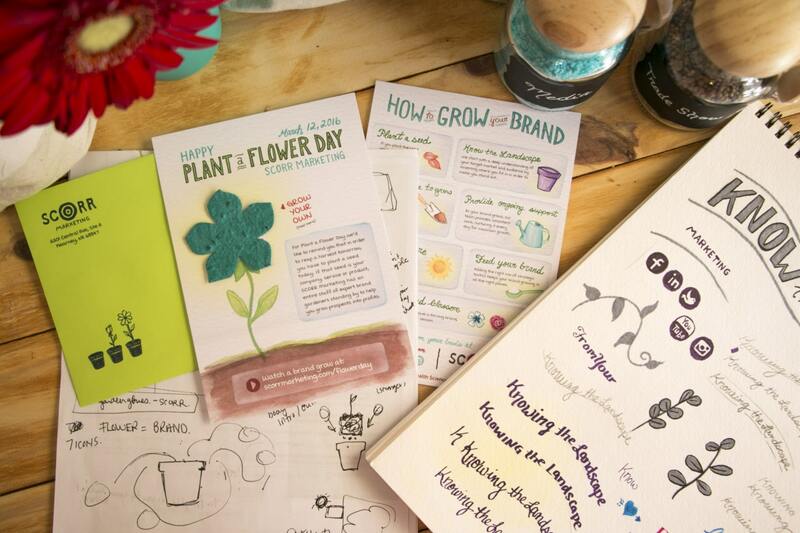 The card included step-by-step instructions on “How to Grow Your Brand,” reminding recipients how crucial it is to provide proper care, support and gain exposure for their company’s brand. 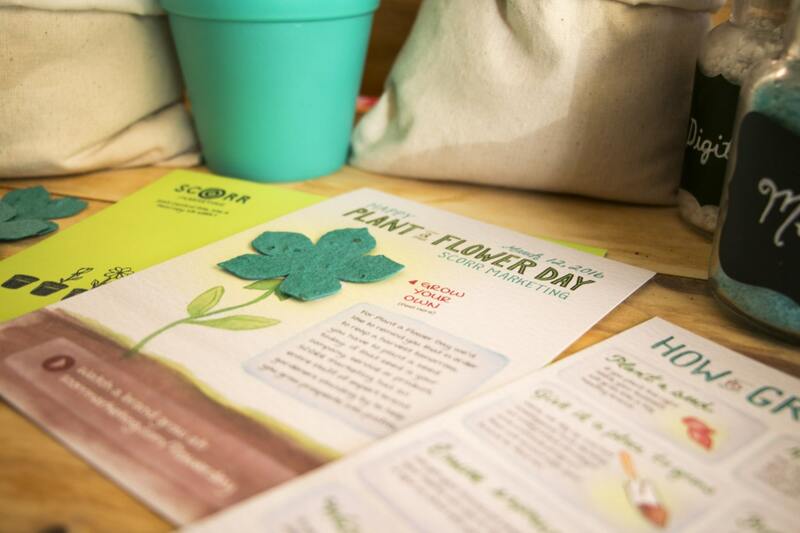 Each mailer was also accompanied by seeded cardstock in the shape of a flower, which, when planted, would grow into a flower itself. 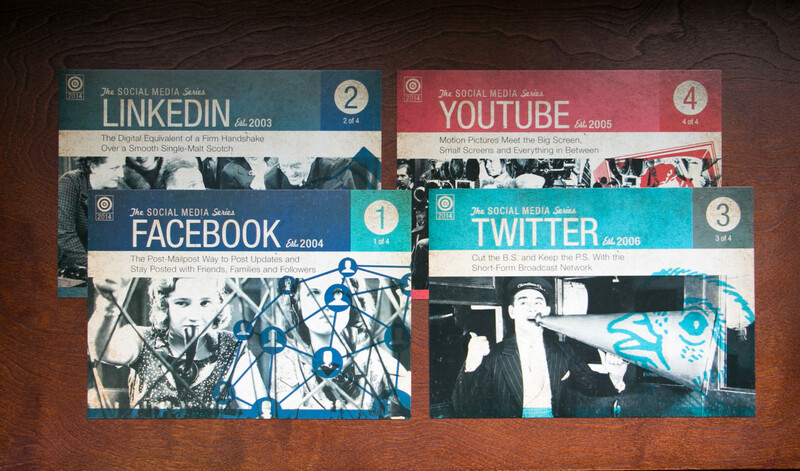 We also created customized skins for our social media platforms as well as a video that went through each of the steps in live action. 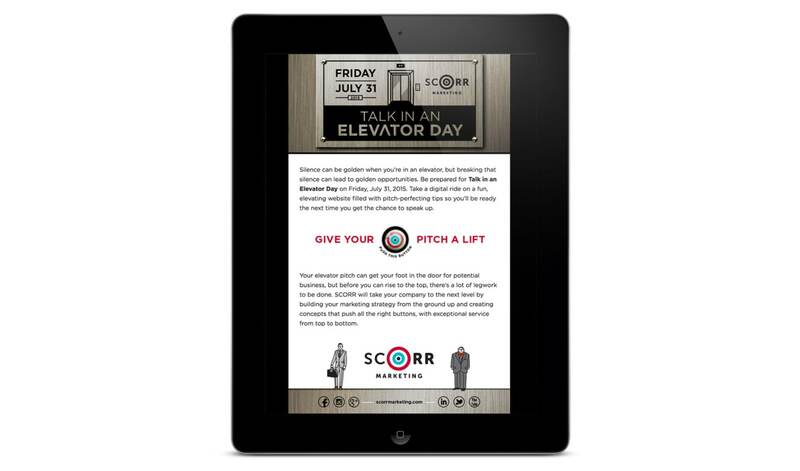 To celebrate Talk in an Elevator Day, SCORR sent out an elevator-themed, three-dimensional card with an embedded speaker that played an audio skit encouraging recipients to visit the microsite we developed. 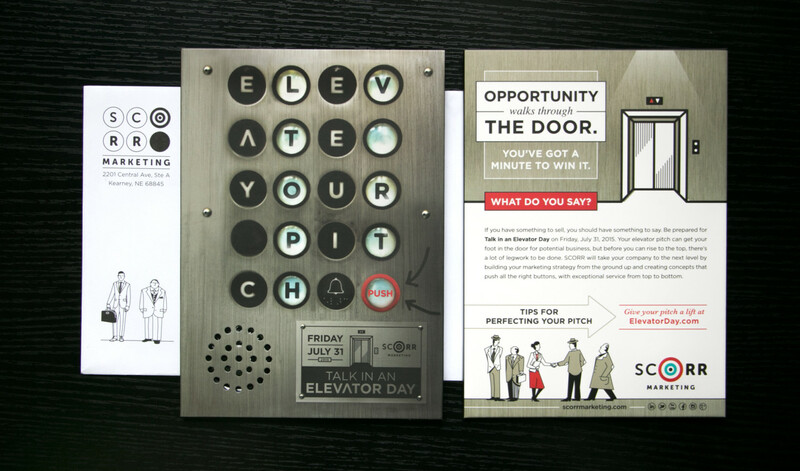 To accompany these cards, we built an interactive, parallax microsite where visitors received tips on developing an effective elevator pitch. 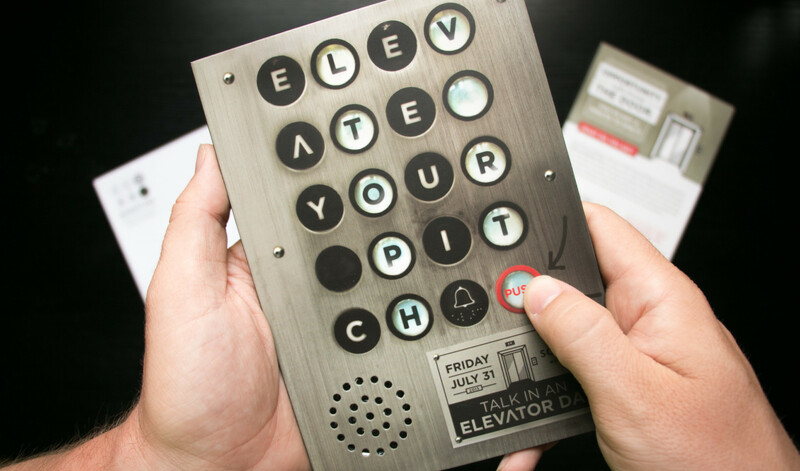 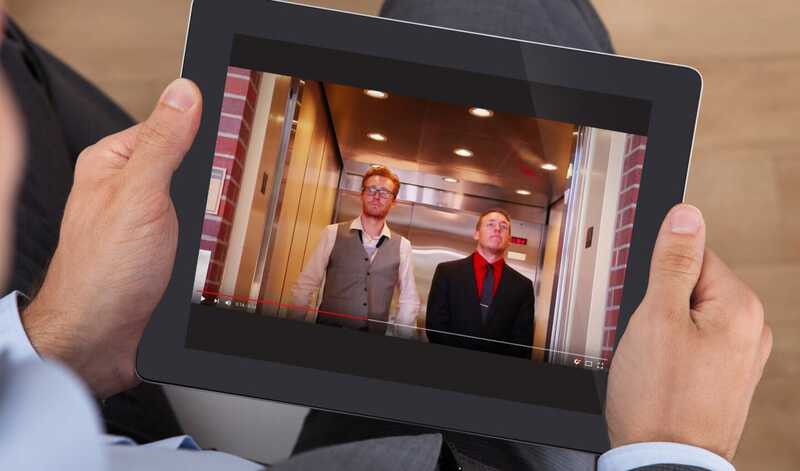 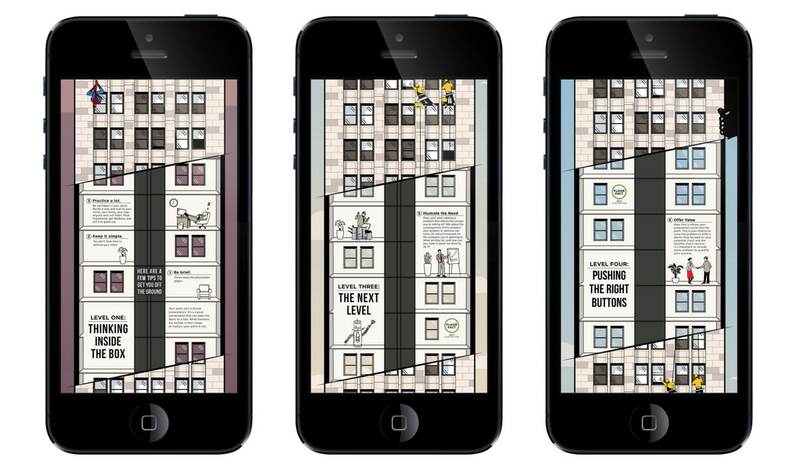 The intuitive navigation featured interesting elevator-related facts, comical videos of elevator encounters and amusing background characters including Spider-Man, King Kong and Office Bot, an internal office creation (patent pending). 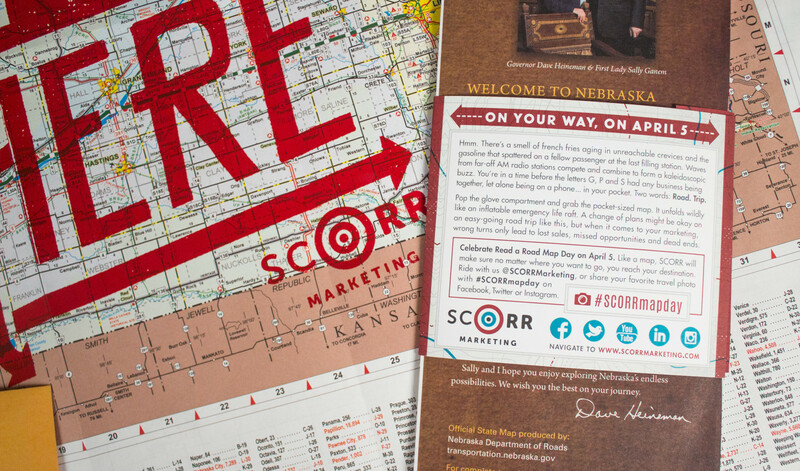 To celebrate Read a Road Map Day, SCORR took Nebraska maps and added a custom screen print design. 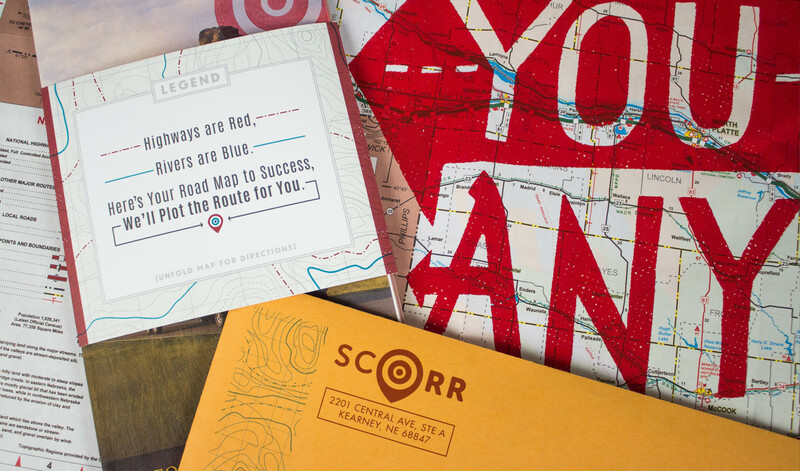 The maps were wrapped in a belly band and sent out in unique envelopes to our clients. 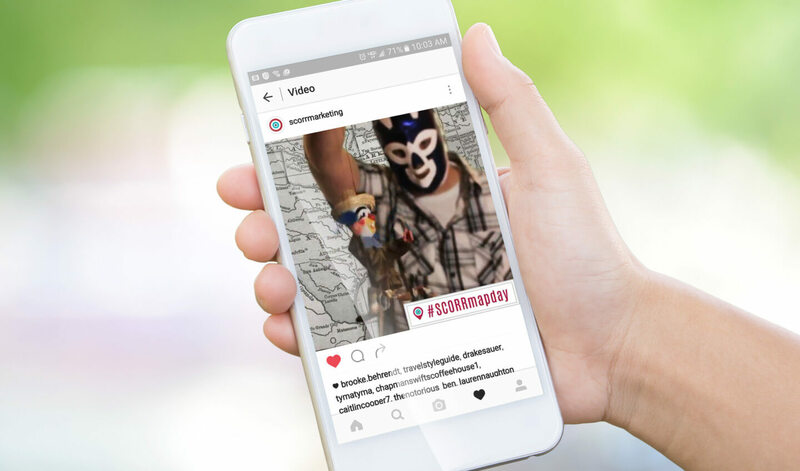 We also conducted a social media campaign encouraging employees and fans to share their favorite photos, souvenirs and stories of their travels. 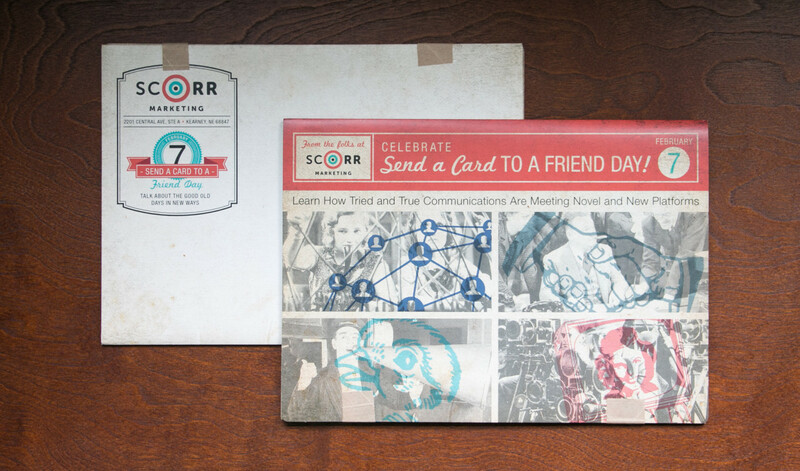 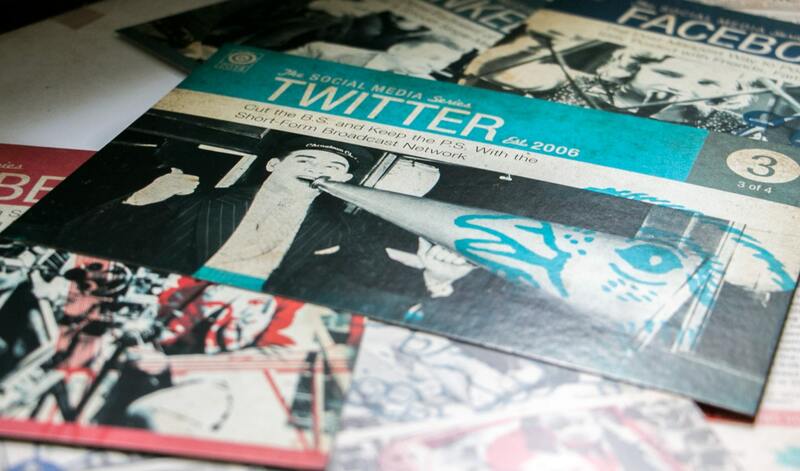 To celebrate Send a Card to a Friend Day, SCORR mixed tried and true with novel and new marketing tactics by developing a series of four postcards, each themed like a social media network, to encourage recipients to connect with friends. 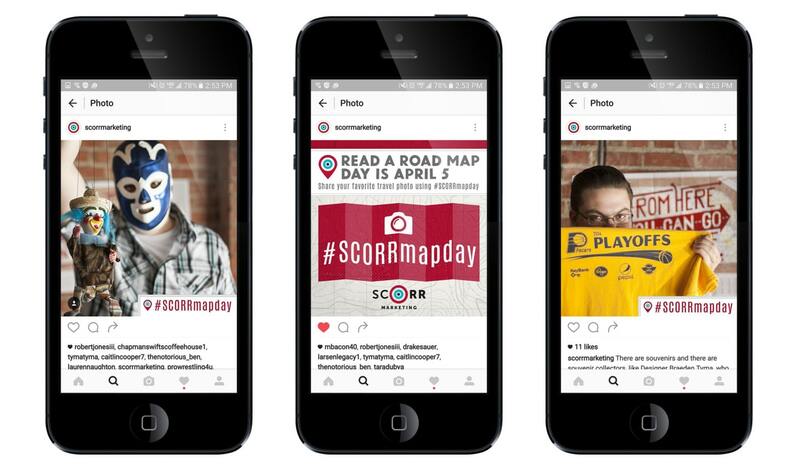 The mailer included a decision map to help recipients learn more about the four networks at hand and how they could “play their cards right.” Along with vintage skins for SCORR’s social media pages, the digital team built a retro-themed microsite to help people get to know the social media networks that help them connect with others. 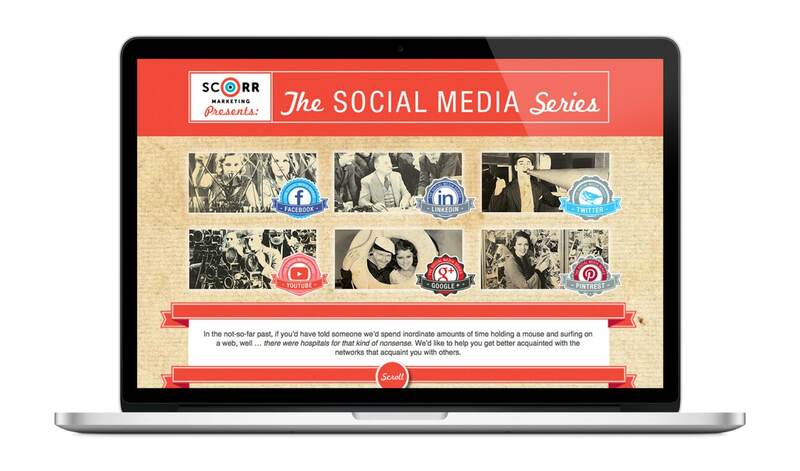 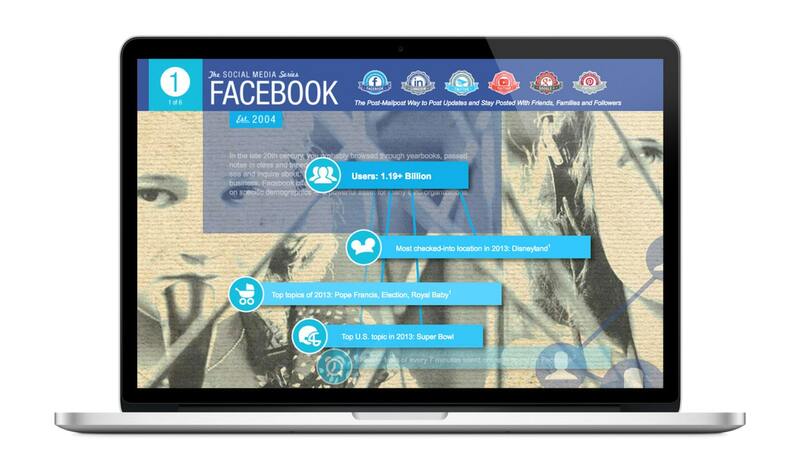 The informative social media series page featured stats and trivia, such as 2013’s top three superheroes watched on YouTube, most checked-into places on Facebook and most used adjectives on LinkedIn profiles. 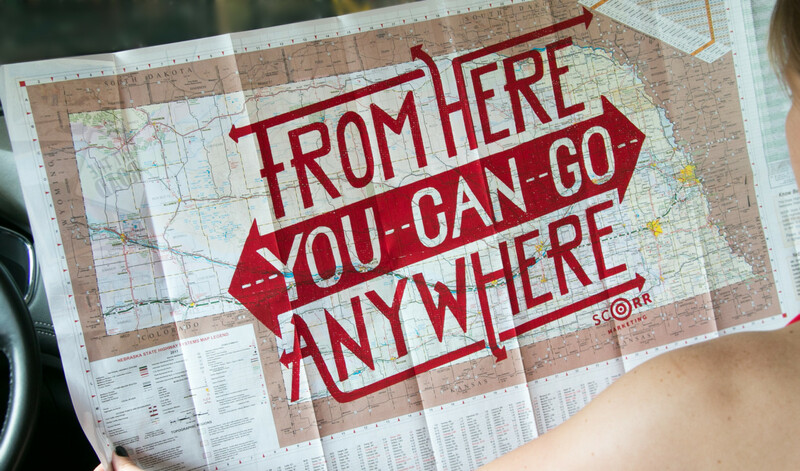 Internally, our team took up our pens to write postcards that we sent to clients around the globe. 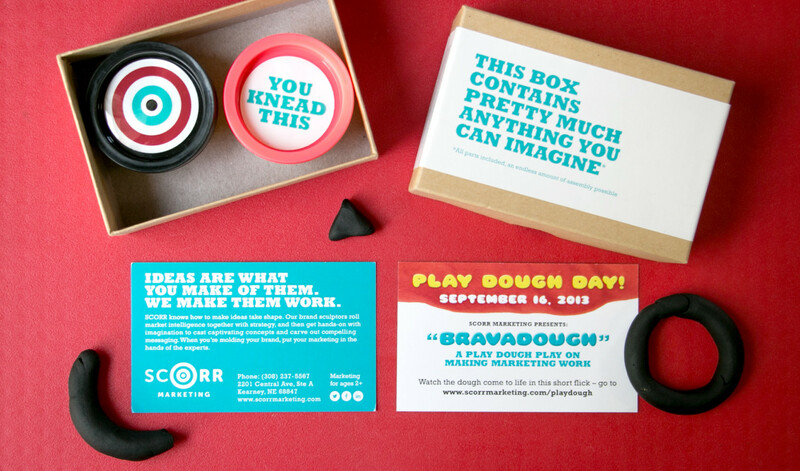 To celebrate national play dough day, SCORR sent out boxes containing “Pretty Much Anything You Can Imagine” with “All parts included, and an endless amount of assembly possible.” Inside, recipients were given two tubs of play dough along with a card directing them to our specially themed webpage. 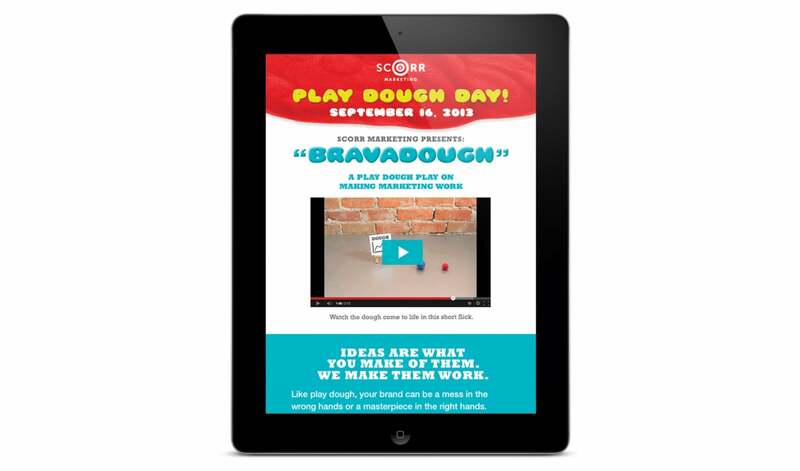 To show how creative the SCORR team really can be, our team members sculpted a short, stop-motion animation flick titled “Bravadough,” along with a themed web page. 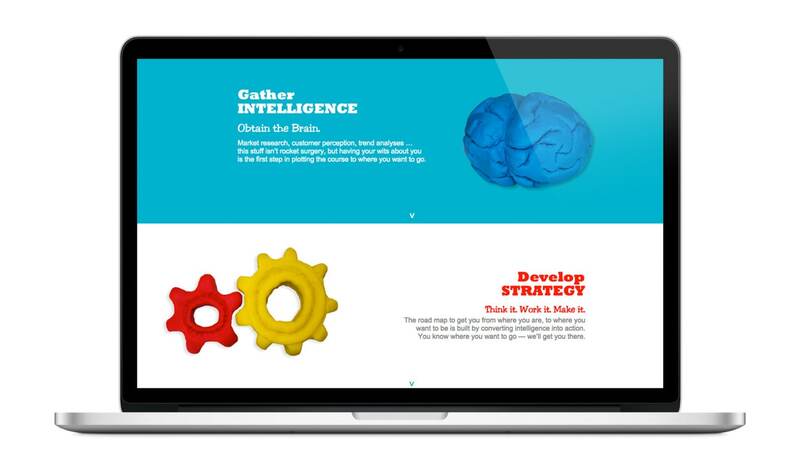 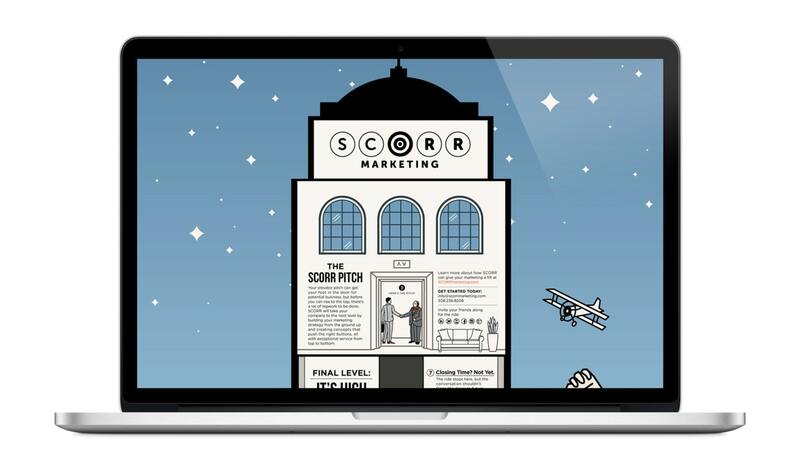 The web page explained how the SCORR team rolls market intelligence together with strategy and then gets hands-on with imagination to cast captivating concepts and carve out compelling messaging. 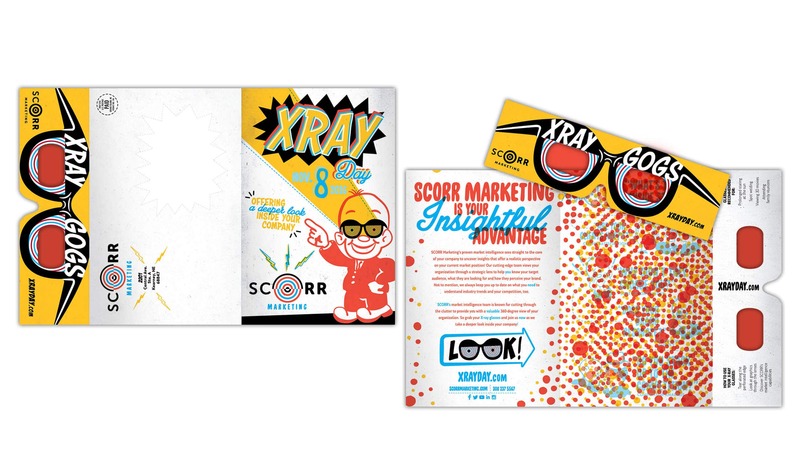 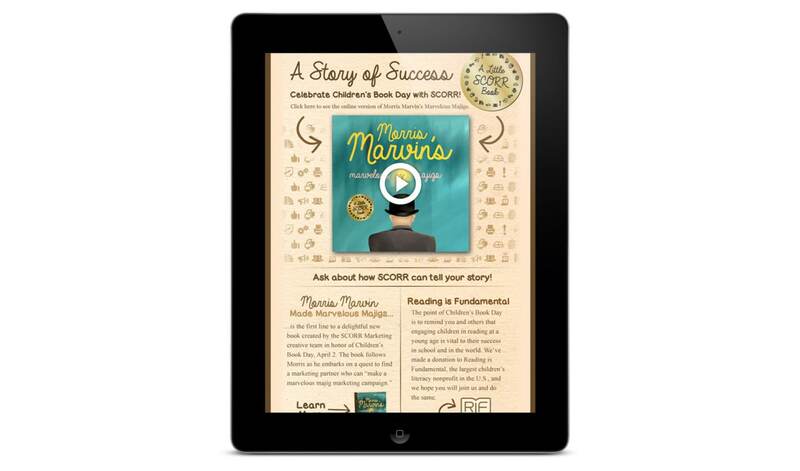 In honor of Children’s Book Day, SCORR created a book reminiscent of the classic Little Golden Books series. 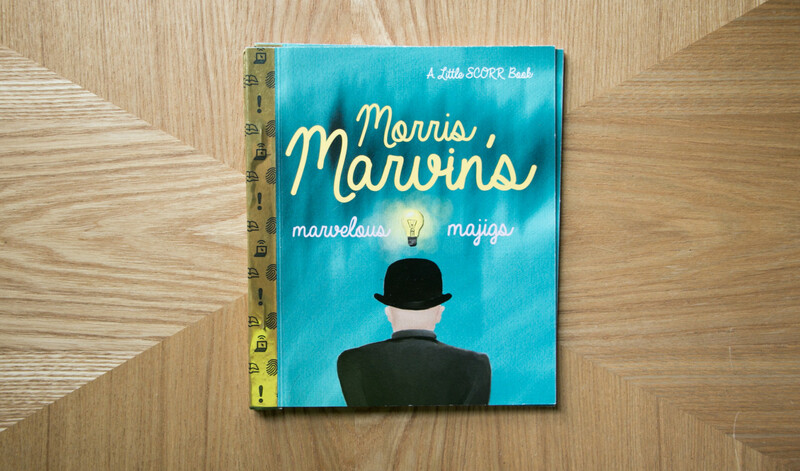 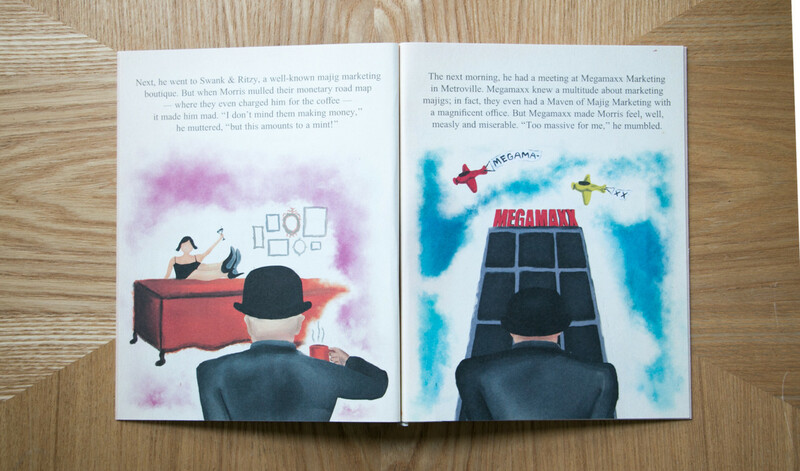 The book, Morris Marvin’s Marvelous Majigs, tells the tale of Morris’ quest to find a suitable marketing partner for his Marvelous Majigs. 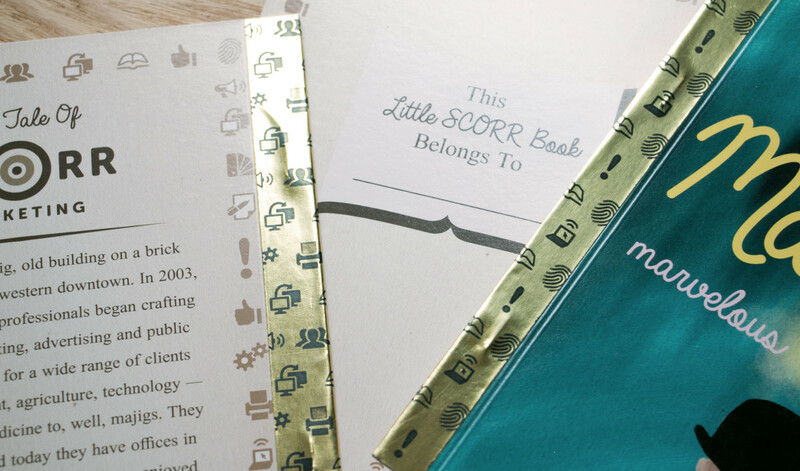 Recipients could flip through the Little SCORR Book and uncover the multifaceted, motivated and modest marketing partner — SCORR. 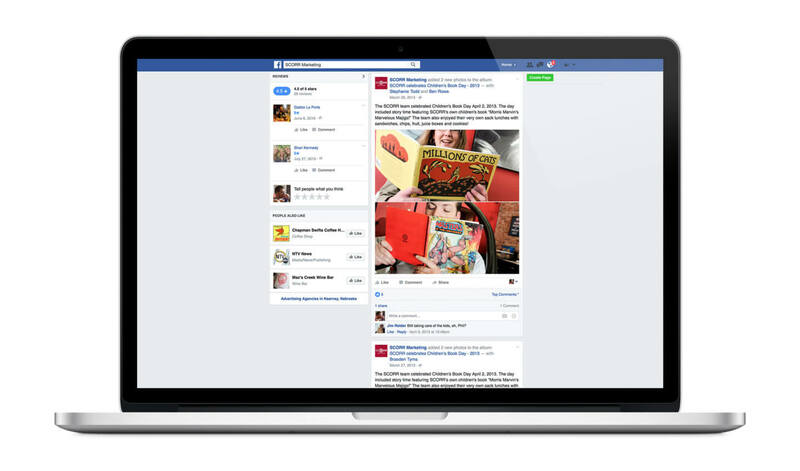 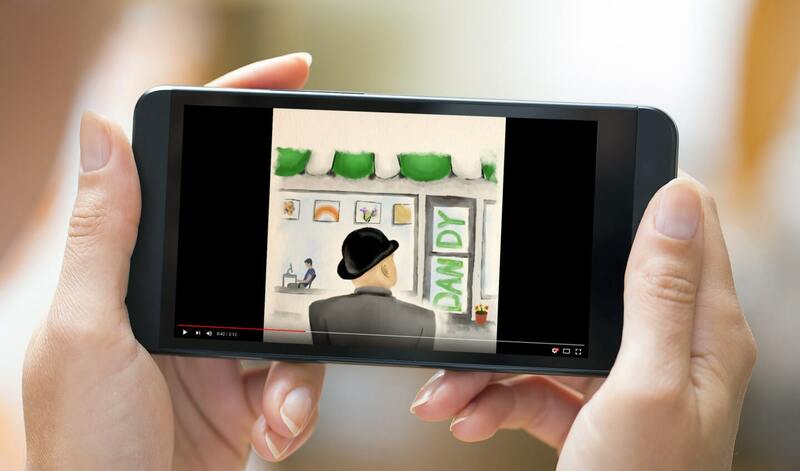 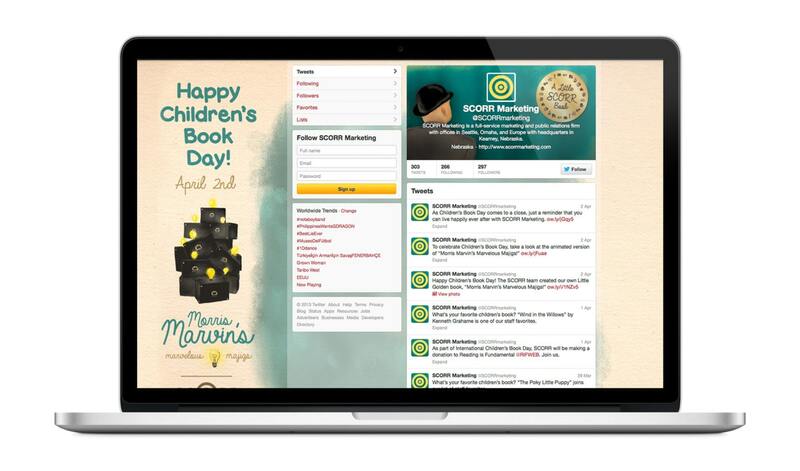 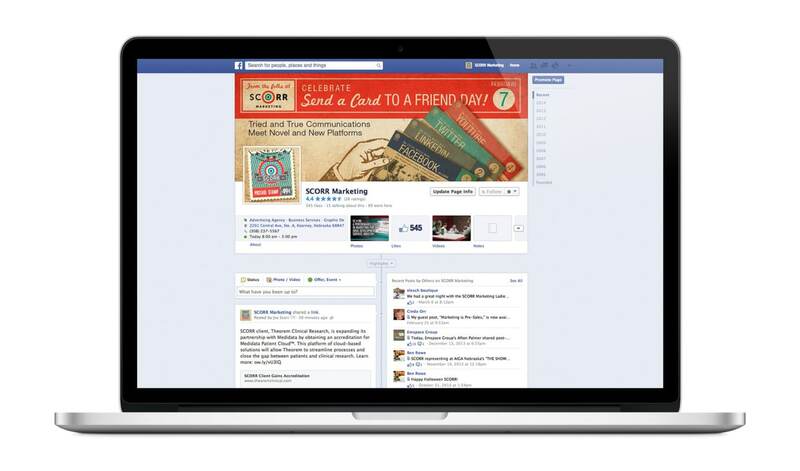 We outfitted our Facebook and Twitter profiles with custom skins, and an email marketing piece showcased the holiday while inviting recipients to visit the microsite where they could listen to a narrated animation of Morris Marvin’s Marvelous Majigs. 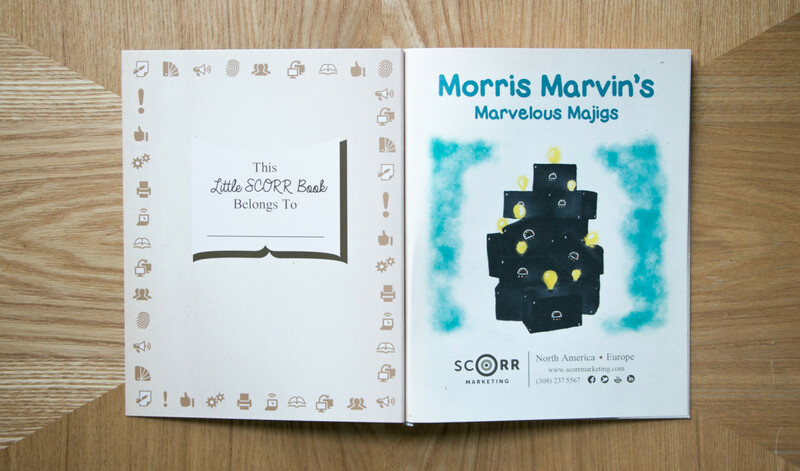 To commemorate the holiday, SCORR also made a donation to Reading Is Fundamental (RIF), the largest literacy nonprofit in the nation. 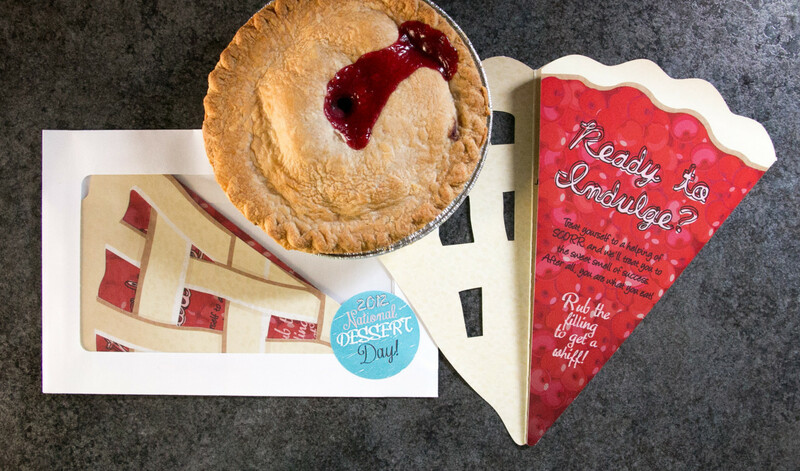 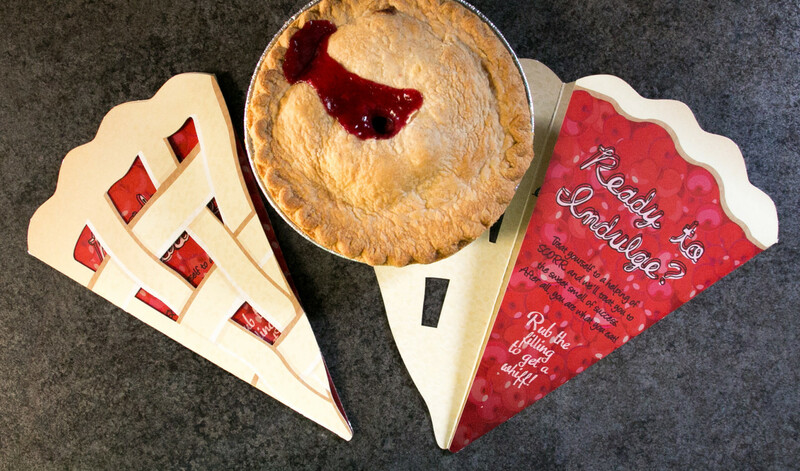 SCORR commemorated National Dessert Day by sending out a die-cut, pie-shaped card delivered to current and prospective clients in bakery box-inspired envelopes with a display window. 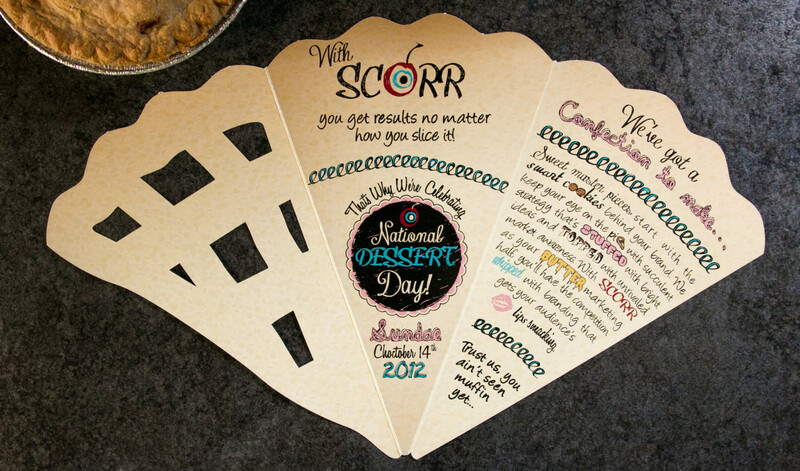 Inside, the card features scratch-n-sniff, cherry-scented filling, along with flavorsome puns detailing SCORR’s unique bond with the holiday. 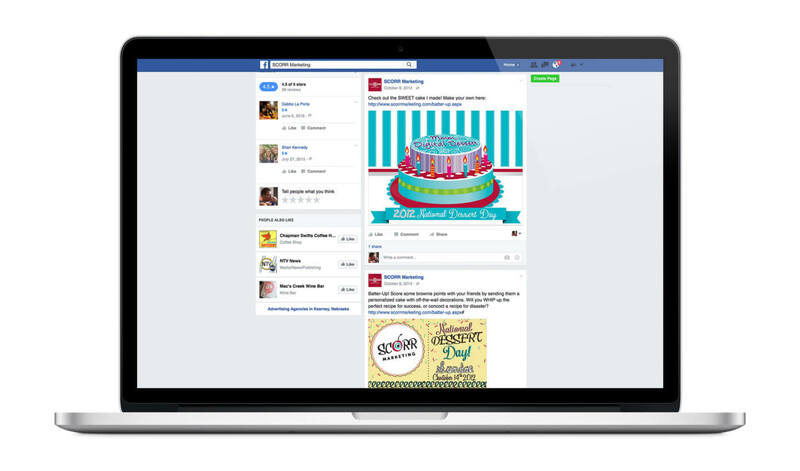 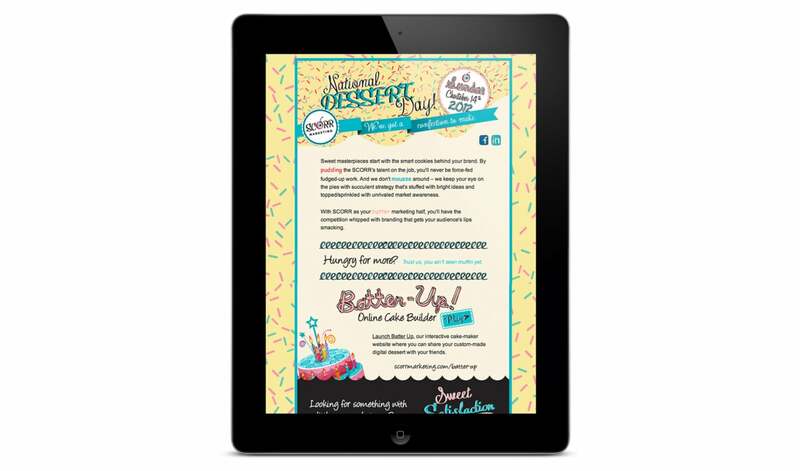 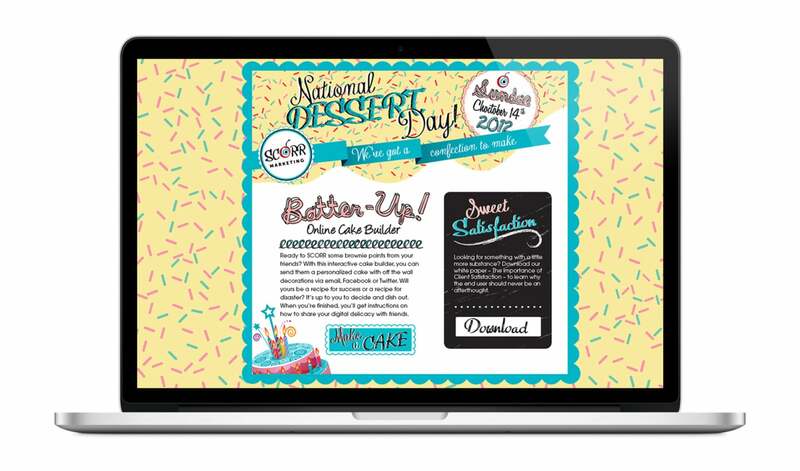 The promotion included dessert-themed social media skins and a promotional email inviting recipients to partake in the smorgasbord of sweet activities created for the holiday. 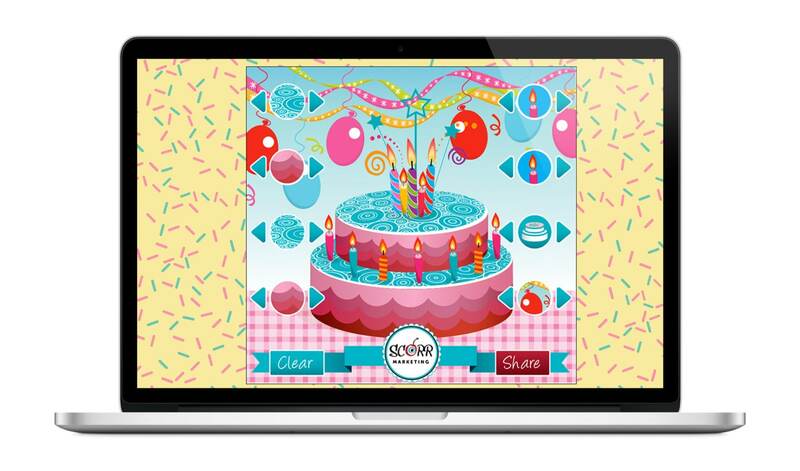 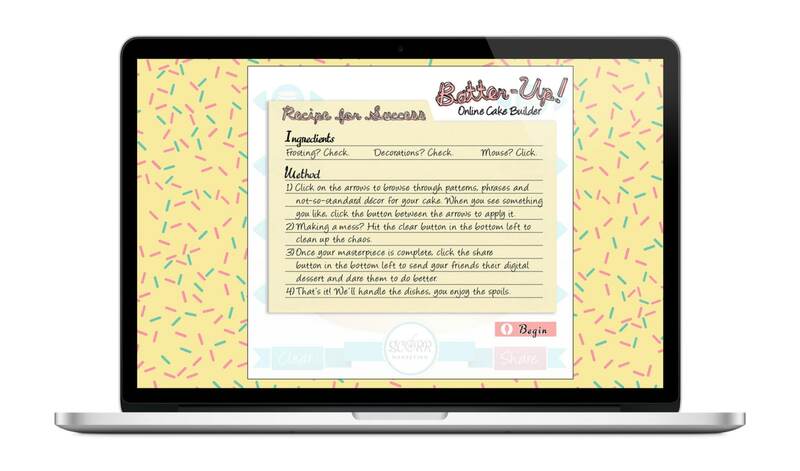 Though SCORR celebrated internally with a cake decoration challenge, a specially themed microsite included “Batter-Up,” an interactive cake builder that allowed visitors to whip up their own cakes with off-the-wall decorations. 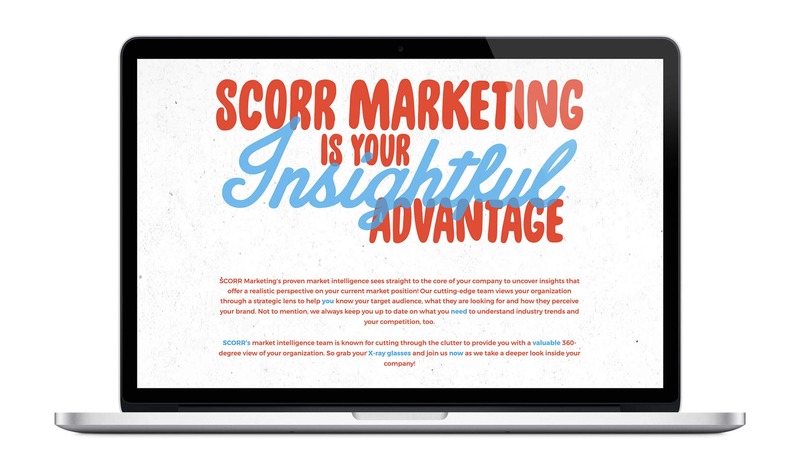 The microsite also included a link to download SCORR’s free white paper on the importance of client satisfaction.